The most common and now quintessential form of NY pizza has thus become the type that is cooked in gas ovens rather than the Neapolitan-American type cooked with coal. 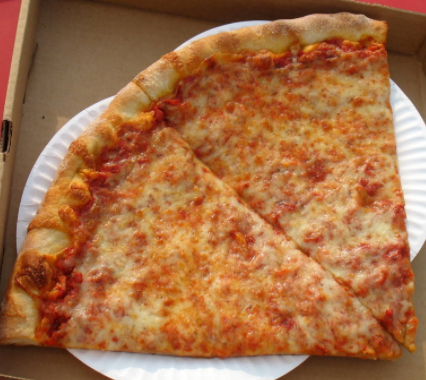 NY style pizza is sold either as whole pies or by the “slice” — a triangular wedge cut from a whole pizza. Typically, an 18″ NY pizza yields eight slices. With the exception of Patsy’s, none of the original coal oven pizzerias sell pizza by the slice. The availability of slices of pizza fundamentally changed the nature of pizza in NYC, liberating it from the restaurant and substantially lowering the financial barrier of entry. NY style is virtually defined by the low cost of entry, the immediacy of service, and the portability of the product.The NY style pizzas tend to have far more cheese than Neapolitan-American coal oven pies. The cheese typically covers the entire pie, with sauce only poking out along the circumference. A low moisture mozzarella is used rather than fresh mozzarella, which is not well suited to the lower temperature and longer cooking times of the gas ovens. Gas fired pizza lacks the sooty exterior that is a hallmark of coal fired ovens, but it still has plenty of crunch and snap to go along with the pliancy and springiness of the dough. In addition to the classic round pizza, most every pizzeria also sells Sicilian style pies and slices. Characterized by a rectangular shape due to being pan cooked, with a crust that is generally over an inch thick, this style of pizza originated in the bakeries, not the pizzerias, of Sicily, where it is sold as Sfincgioni. In Sicily, Sfinciuni is topped with a tomato sauce spiked with anchovies and onions under a canopy of breadcrumbs rather than the tomato sauce and cheese we see in NYC. That latter recipe is the result of the American melting pot effect of throwing Neapolitans and Sicilians together into lower Manhattan. You can find a version of Sfinciuni sold at Prince Street Pizza as the Broadway Breadcrumb and also at Famous Ben’s as the Palermo slice. Some of NYC’s most storied pizzerias specialize in square slices like L & B Spumoni Gardens in Brooklyn and Rizzo’s in Astoria, Queens. WHO MAKES NEW YORK’S BEST PIZZA ??? Lombardi’s thrived in Little Italy, feeding legions of factory workers and immigrants longing for a taste of home. It was so popular that Lombardi soon dispensed with the groceries entirely and started selling pizza exclusively. Numerous employees struck out on their own, fanning out across the city and spreading the distinctive style of pizza. According to the owners of Totonno’s Pizza, sisters Cookie Cimineri and Antoinette Balzano will not tolerate anyone telling them someone besides their grandfather Anthony “Totonno” Pero brought pizza to America. They don’t want any money, so much so that if you disagree, they’ll probably kick you out before you can order. 1905: Gennaro Lombardi’s opens America’s “First Ever Pizzeria” at 53 1/2 Spring St. in Lower Manhattam, New York, NY .. Some famed Pizzaioli (Pizza Makers) work there over the years;Anthony Pero founder of Totonno’s Coney Island, John Sasso of John’s Pizza Bleecker Street, and Pasquale Lancieri aka “Patsy” who opens “Patsy’s Pizzeria in Eats Harlem. A Pizza cost a Nickel at Lombardi’s in 1905 ..1924: Anthony “Totonno” Pero opens Totonno’s in Coney Island. Establishes unusual ritual that some Pizzerias carry on to this day. When the dough runs out, the Pizzeria close for the day. 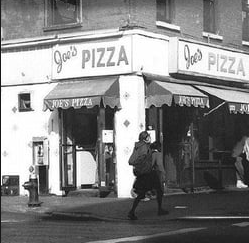 1929: John Sasso opens John’s Pizzeria on Bleecker Street. 1933: Pasquale “Patsy” Lancieri opens Patsy’s in East Harlem. 1956: Average cost of a slice of New York pizza: 15 cents. Price keeps pace with cost of subway fare, seen as a kind of an economic indicator. 1959: Ralph Cuomo opens Ray’s Pizza on Prince Street. 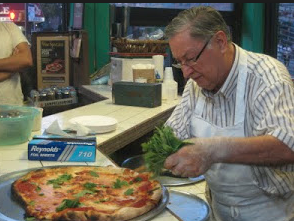 1964: Di Fara Pizza opens in Midwood, Brooklyn. 1977: Saturday Night Fever: John Travolta double-slices it at Lenny’s in Bay Ridge. 1990: ThreeRay’s owners, none of them named Ray, band together, form a coalition to trademark the name, and eliminate impostors, or make them pay a fee. 1994: Seventy-nine people are arrested for operating an international drug ring out of a midtown Famous Original Ray’s. 2004: Zagat awards Di Fara 28 rating for food along with Le Bernardin and Jean Georges; Di Fara also receives lowest rating ever for décor: 5. GET THE SECRET RECIPE !! !